Jonny Lee is back with the 3D printed magic… This time he 3D prints molds for BMX grips! Over the past year, Jonny Lee has been experimenting with 3D printing different BMX parts. Today he dropped a video showing us how he made his own BMX Grips by 3D printing his own mold. This video shows you how the mold was made, minus the CAD drawing part that he usually shows in his videos, along with some footage of him riding with the grips. Hit play and take a look! “This took a lot longer to make then I had anticipated! I’ve wanted to make custom BMX grips for a while, I finally got it figured out so here you go! They turned out great and I have every ambition to keep riding them for the foreseeable future, encase you were wondering. The Cult X Vans Grips and Tires are now available in a new Pink color! Just in time for Valentines day! The ever popular Cult X Vans Grips and Tires that are based off the Vans Waffle sole pattern are now available in this new Pink color through BMX shops and mail-orders that carry Cult worldwide now. The Cult X Vans Tire is available for $27.99 and the Cult X Vans Grips are available for $10.99! If you’re looking to freshen up your bike with a little pink, this is for you. Not sure if it will look good? Check out a video of Anthony Panza put together showing you his bike built up with the tires below! “After wearing Vans for most of our lives, we wanted to see if the Vans waffle pattern would work as well with our hands as it has with our feet. The grip was designed by Cult and sent to ODI for production. Using their proprietary rubber compound, we have created a grip that we hope will become as much of a classic as a pair of Vans. Charlie Crumlish puts his signature Cross Check grips from Merritt to work! What do you think? Did you like the edit? Are you digging the grips? Let us know what you’re thinking in the comments below! Not quite what you’re looking for? 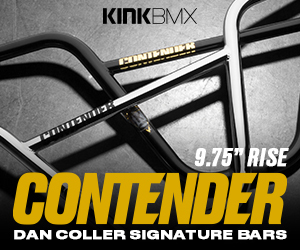 Check out these BMX grips. Broc Raiford’s signature Odyssey BMX grips now available in pink and black swirl! Is it time for a new set of BMX Grips? Here’s a look at the latest color option for the Broc Raiford signature grips from Odyssey; pink and black swirl! These grips and 160mm long and have a ribbed center with ends that have rope style detailing to match the Nautical theme of all of Broc’s signature parts and a small ODSY logo. If the pink and black swirl isn’t for you, they’re also available in Black, Gum, Black/Blue Swirl, Black/White Swirl, Black/Purple Swirl, and Black/Red Swirl for $9.99 through BMX shops and mail-orders that carry Odyssey worldwide now. What do you think? Are you digging the color or not so much? Have you ran these grips before? How did you like them? Let us know in the comments below! “Connor Keating testing out his new signature grips in the back lot. The Piston Grips from Stranger are available in Black, Purple and Red for $10.99 through BMX shops and mail-orders that carry Stranger BMX worldwide now. What do you think of the Piston Grips from Stranger? Do you have any questions? Let us know what you’re thinking in the comments below! Is it time for a fresh pair of BMX Grips? Take a closer look at the new Dialed Grips from Subrosa Brand. These grips are made from their DCR (Dura Choice Rubber Formula) material that is soft, but more durable than traditional Krayton rubber. The grips feature a wrapped line pattern that criss crosses giving you comfort and plenty of grab. You can find a few small Subrosa logos on the ends. The grips are 160mm long, have no flanges and come with matching nylon bar ends. “Off the success of the Genetic Grip, we knew we were on the right track with grips, so we set out to make the new Dialed Grip. Using the same materials, the same diameter, but we shortened the overall length to accommodate riders who use brakes.” – Subrosa. The Dialed grips are available in black, Black and Red Marble and Ice Blue through BMX shops and mail-orders that carry Subrosa worldwide for $11.99. You can learn more about the grips on the Subrosa Website. 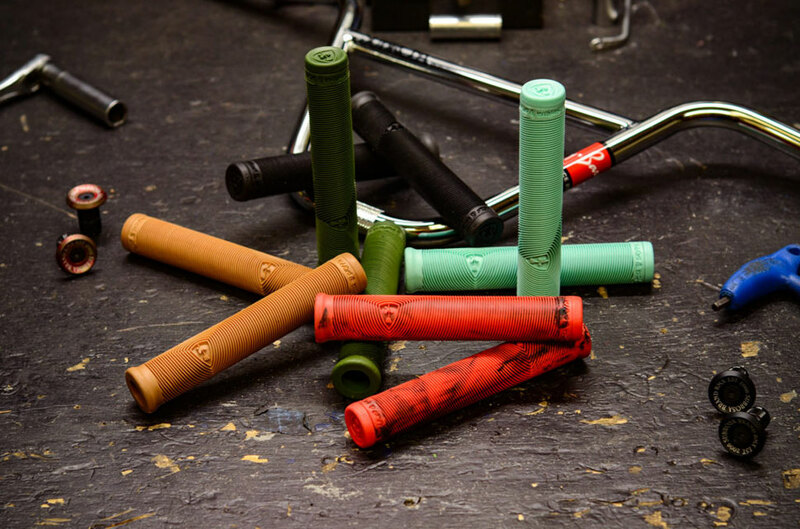 What do you think of the Dialed Grips from Subrosa? Do you have any questions? Let us know what you’re thinking in the comments below! Note: This post contains affiliate links and we could receive a commission if you were to buy these grips. We would never tell you about a product unless we were completely stoked on it.